What do the BMW-Isetta, a Rolls Royce Phantom Drophead and my 1200RT all have in common? I don't want any of them? Pete, you can’t fit inside the Isetta. Pete, you’d like the Phantom, can fit inside, but can’t afford it. A few BMW Isetta. on ebay from 13k. And a rare 4 wheel one. It is crazy isn’t it. I’d love an origami Fiat 500, or an Isetta, but as you’ve seen, they’ve gone mad. By the way, origami should be original! But I left it in to show what predictive text just did! 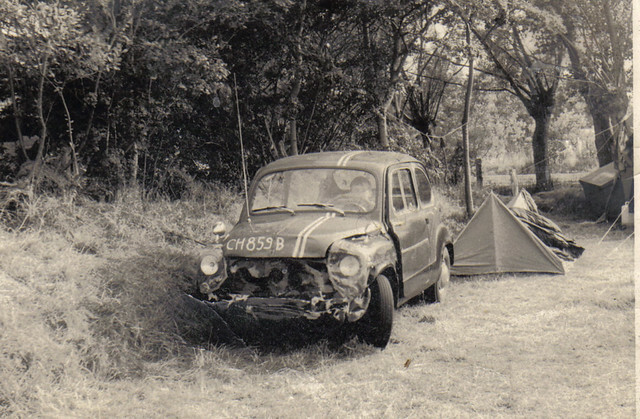 This is was my origami Fiat 500 after I hit a Volkswagen Variant in the 1960's in Brussels. ( That's my wee brother behind the wheel). It wasn't actually a 500, it was a Jagst 600. I drove it from Ostend to Germany like that and sold it to a fella who wanted the engine. Judging by the amount of steel that's been folded I think origami is the right word!